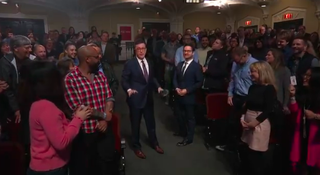 Jokingly introduced by Stephen Colbert as the beloved screenwriter of the 1997 Joe Pesci-Danny Glover comedy Gone Fishin’ (4.7 user rating on IMDb), J.J. Abrams came out for his Wednesday Late Show appearance bearing, seemingly, nothing. Sure, the co-writer of the 1990 Jim Belushi vehicle Taking Care Of Business was carrying effusive praise for Colbert’s graceful change in both job and venue since they last spoke during the Colbert Report days. And, yes, Abrams did share an endearing anecdote about the time when, right before the release of his first outing at the helm of his second beloved sci-fi series sequel/reboot, he called Colbert out of the blue and nervously asked if he could come to Colbert’s Comedy Central office “to just drink.” And, okay, Abrams did reveal that his as-yet unnamed ninth Star Wars film does have a final script locked in—which is nice, since the thing starts shooting in July.